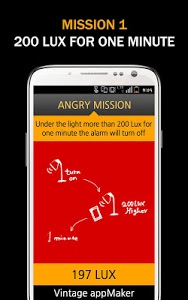 ANGRY MISSION - Under the light more than 200 Lux for one minute the alarm will turn off. MAD MISSION - If you shake it from side to side the alarm will turn off. 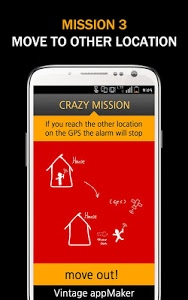 CRAZY MISSION - If you reach the other location on the GPS the alarm will stop. 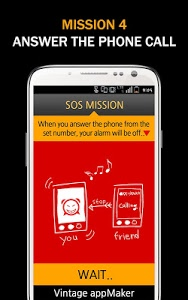 SOS Mission- It's real morning call. -Whatever you choose, When you answer a call the alarm will stop. -Your device must have a Light, GPS and Acceleration sensor with itself. - If you just let the alarm ring, it will stop in 5 minutes. 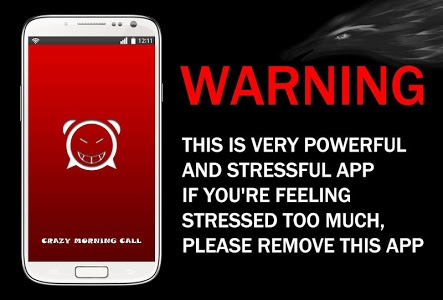 Stop the alarm when the phone is ringing. When the alarm sounds, turn on the camera on the camera. Only the personal information collected is used on this app. No one is able to approach it in the ordinary way except for the user. 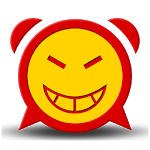 this app don't store it(information) on either the SD card or the server.